Imagine camping every other weekend in this travel trailer with your spouse and kids. The queen bed in the private bedroom will provide a great night's rest and the kids can crash on the u-dinette once folded down. This unit is satellite ready and includes a pantry for your non perishables. The full rear bath with a tub/shower makes bath time for the little ones a breeze. 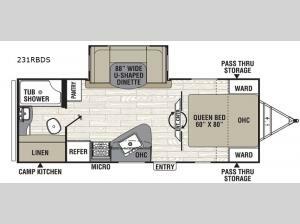 Everyone can grab their camp chairs and prepare for a fun evening outdoors because this unit includes a camp kitchen and a 14' electric awning with LED lights!